Mary Tyler was born on 28 June 1775 possibly in New York, and passed away on 17 March 1858 in Coolville, Athens, Ohio. 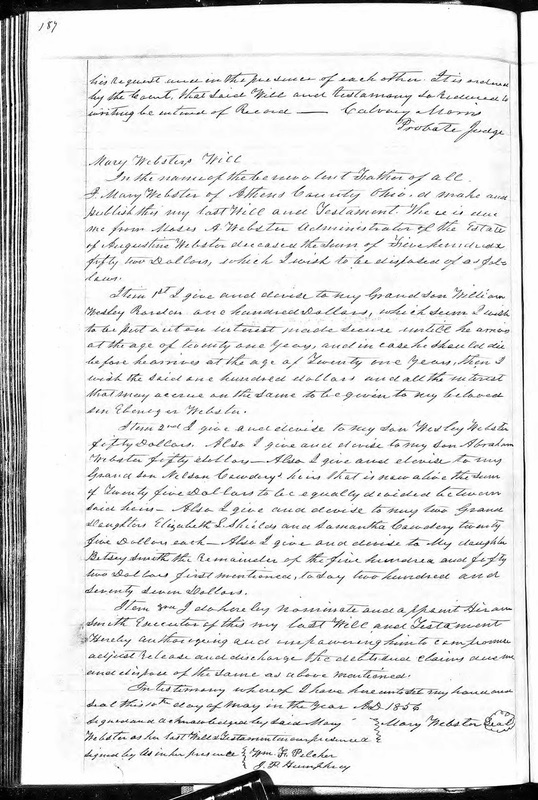 She married Augustine Webster, my 4th great-grandfather, on 20 October 1793 in Columbia, New York. Here's the transcription of Mary's will, transcribed to the best of my ability. If there are errors, please let me know in the comments below. In the name of the benevolent Father of all I Mary Webster of Athens County Ohio, do make and publish this my last Will and Testament. There is due me from Moses A. Webster Administrator of the Estate of Augustine Webster deceased the sum of Five hundred & fifty two Dollars, which I wish to be disposed of as follows. Item 1st I give and devise to my Grandson William Wesley Rardin one hundred Dollars, which sum I wish to be put out on interest made secure until he arrives at the age of twenty one years, and in case he should die before he arrives at the age of Twenty one years, then I wish the said one hundred dollars and all the interest that may accrue on the same to be given to my beloved son Ebenezer Webster. Item 2nd I give and devise to my son Wesley Webster fifty Dollars. Also I give and devise to my son Abraham Webster fifty dollars. Also I give and devise to my Grandson Nelson Cowdery's heirs that is now alive the sum of Twenty five Dollars to be equally divided between said heirs. Also I give and devise to my two Grand Daughters Elizabeth L. Shields and Samantha Cowdery twenty five Dollars each. Also I give and devise to my daughter Betsy Smith the Remainder of the five hundred and fifty two Dollars first mentioned, to say two hundred and Seventy Seven Dollars. Item 3rd I do hereby nominate and appoint Hiram Smith Executor of this my last Will and Testament Hereby authorizing and empowering him to compromise adjust Release and discharge the debts and claims due me and dispose of the same as above mentioned. In testimony whereof I have hereunto set my hand and seal this 10th day of May in the year AD 1856. Signed and acknowledged by Said Mary Webster as her last Will & Testament in our presence & signed by us in her presence. Moses A. Webster - Mary's son and my 3rd great-grandfather. I wrote a blog about him in a previous post. Augustine Webster - Mary's husband. William Wesley Rardin - Mary's grandson. William is the son of Mary's daughter Samantha and her second husband, Moses Rardin. Ebenezer Webster - Mary's son. I wrote about Ebenezer in a previous post. Wesley Webster - Mary's son. I wrote about Wesley in a previous post too. Augustine Webster - Mary's son. I also wrote about Augustine in a previous post. Nelson Cowdery - Mary's grandson. 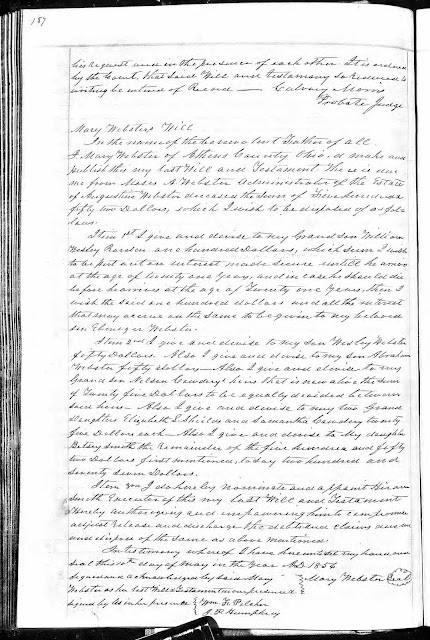 I don't have Nelson in my genealogy database, but Mary's daughter Mary was married to a man named Ethan Cowdery. Elizabeth L. Shields - Mary's granddaughter. I don't have Elizabeth in my genealogy database either. And I don't know of any of Mary's daughters marrying anyone with the last name of Shields. Samantha Cowdery - Mary's granddaughter. I also don't have Samantha in my genealogy database. Could she be Nelson Cowdery's sister? Betsy Smith - Mary's daughter. Hiram Smith - Mary's son-in-law and husband of her daughter Betsy. Mary's last Will and Testament is such a valuable document. In it she mentioned three people that I had never heard of before: Nelson Cowdery, Elizabeth L. Shields, and Samantha Cowdery. Who were they? Where and when were they born? Did they get married and have families of their own? I now have the opportunity to put on my genealogy detective hat and do some family history research so I can find the answers to these questions. FamilySearch published this fun video called "Attend RootsTech 2016" on September 25th and I want to share it with you today. As you may already know, I'm a RootsTech Ambassador. I'm so excited to attend RootsTech next year! And really, it will be here before we all know it. It's only a little over four months away. Have you registered yet? If not, you can access the RootsTech registration page by clicking HERE. Sepia Saturday: Uncle Renza by Wendy Mathias, author of Jollett Etc. I thought I'd pass on this new-to-me feature on FamilySearch Family Tree. See the red box above? In the not-too-distant past, I used to only see FamilySearch listed as an option for searching records. Now Ancestry, Findmypast, and MyHeritage are listed as well. I think this is fabulous! I clicked on the MyHeritage link and found a newspaper article that mentioned my Grandfather Debs. Awesome! 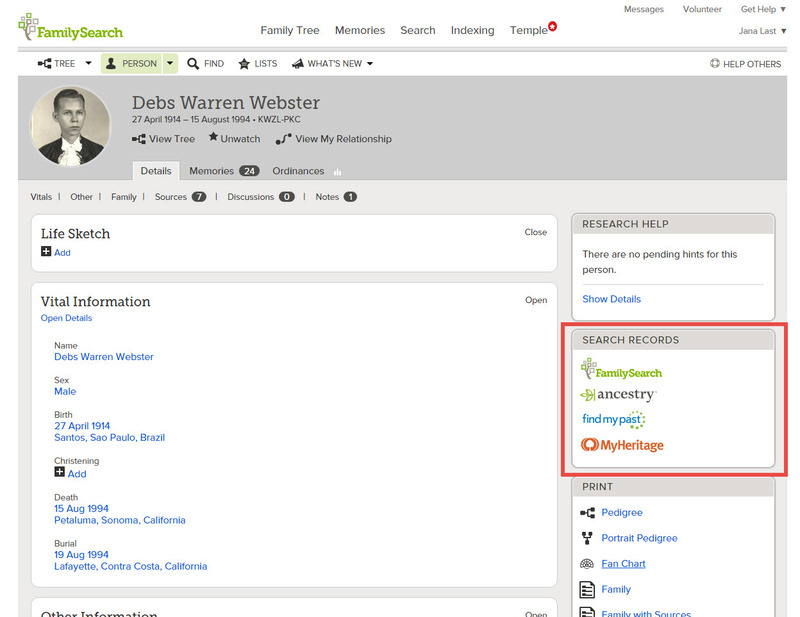 Are you seeing these additional websites listed under the "Search Records" area of your FamilySearch Family Tree as well? Update: Apparently, this is a new feature, so I wasn't late to the party. Thank you FamilySearch for this wonderful new feature! See this comfy lobby area? It's near the front doors of the BYU Conference Center. During the BYU Conference on Family History & Genealogy, I sometimes came here to sit and write or just rest a bit. While I was here in the lobby, I met Cindy Moorhead, writer/editor for the Department of Visual Communications, Division of Continuing Education at Brigham Young University. In the photo below, Cindy is sitting on the left next to the table. See that sign sitting on top of that table? It reads "Share your story or a favorite research tip here!" Cindy interviewed conference attendees during the 4-day conference. The two chairs next to the sign in the lobby were reserved for attendees to share their stories with Cindy. 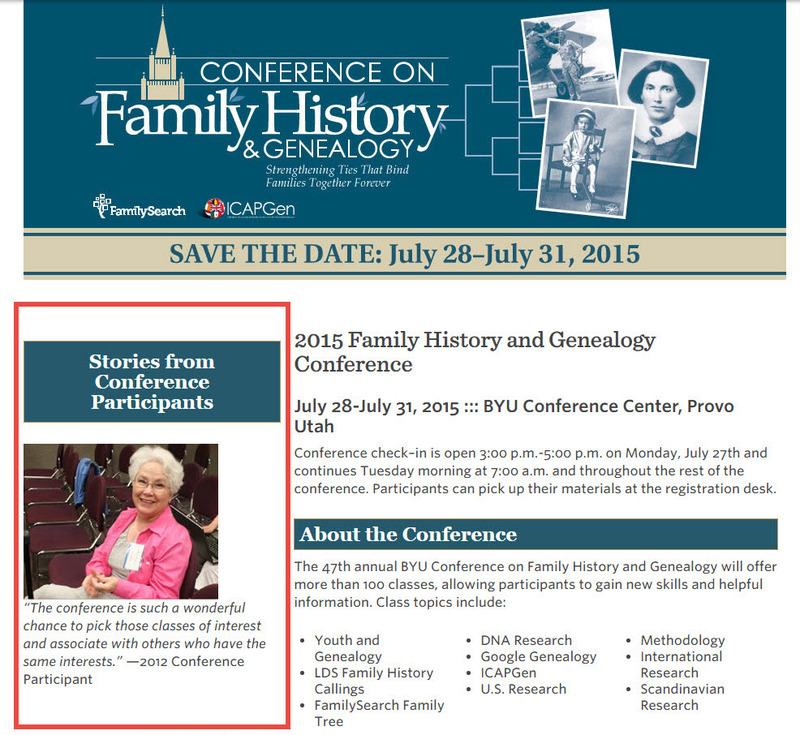 She has interviewed and then posted conference attendee stories from previous years on the BYU Conference on Family History & Genealogy website. On Friday, Cindy interviewed Lynette Banks. Here's how to find the conference attendee interviews on the BYU Conference on Family History & Genealogy website. Click on the "Stories from Conference Participants" button. You'll find a list of participant stories on the left side of the page. Just click on the story you want to read. Cindy told me that all of these stories were written by her from interviews she conducted, except for the three-part series "The William Gilbert Burton Odyssey." That series was written by David G. Burton. The current list of stories are from 2013 and 2014. The 2015 interviews haven't been posted yet, but Cindy hopes they will be soon. Cindy informed me that once the 2015 interviews are posted, they will be promoted on the BYU Conference on Family History & Genealogy's Facebook page. To access their Facebook page, click HERE. It was a pleasure meeting and chatting with Cindy in person at the conference and by email. Please check out her past interviews and look for her upcoming 2015 interviews on the BYU Conference on Family History & Genealogy website and on their Facebook page. I'll be sharing more about my experiences at the BYU Conference on Family History & Genealogy in a future post. RootsTech 2016, Here I Come...As an Ambassador! 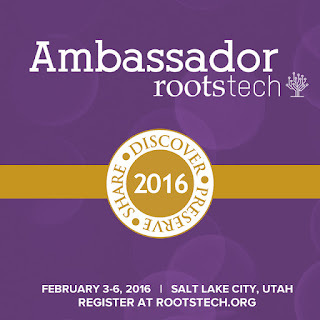 I'm thrilled to announce that I've been selected as a RootsTech 2016 Ambassador! This will be the first time I will be attending RootsTech in person. I've watched their live streamed sessions in past years. In February of 2012, I watched Lisa Louise Cooke's live streamed RootsTech presentation called Genealogy Podcasts and Blogs 101. I had never heard of genealogy blogs and although I had begun my family history research many years earlier, the thought of blogging about my ancestors had never even occurred to me before that time. 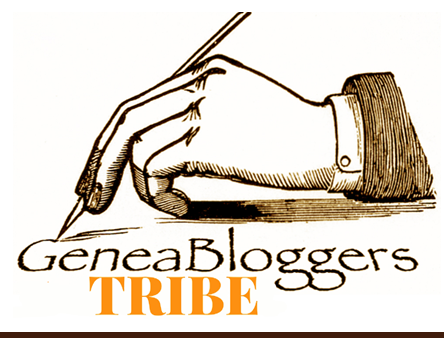 I decided to be brave and jump into the genealogy blog pool and here I am today in my fourth year of blogging. I'm grateful to Lisa for her presentation and to RootsTech for live streaming it. I've watched the RootsTech live streamed sessions at home for several years and they have been wonderful. But, I'm so excited to be able to attend RootsTech 2016 in person next year! Registration for RootsTech 2016 is now open. Class sessions and speakers are listed on the website. There are so many classes to choose from! It's as if a great feast has been placed in front of hungry-to-learn genealogists and family historians. RootsTech 2016 will be held from February 3-6 2016 at the Salt Palace Convention Center in Salt Lake City, Utah. See you at RootsTech 2016! On the final day of the BYU Conference on Family History & Genealogy, I took three classes. The first class I took was "Introduction to British Research." It was part of the British Research Track and was taught by Amy Harris, PhD, AG, who is a BYU Professor, and three of her students. This first class was taught by Kelsee Harris and was focused on British censuses and civil registration. The information presented in this class pertained to England, Scotland, and Wales. Some tips about British census records include the fact that like the United States federal censuses, British Censuses take place every ten years beginning in 1801. Unfortunately, the 1941 census was not taken due to WWII and the 1931 census was destroyed in a fire. Beginning with the 1841 census, every person in the household was listed by name. British censuses records from 1841-1911 can be found at Ancestry.com, Findmypast.com, and FamilySearch.org. Civil registration began in England and Wales on 1 July 1837. Indexes for the records can be found at http://www.freebmd.org.uk/. Civil registration in Scotland began on 1 January 1855. Indexes for these records can be found at http://www.scotlandspeople.gov.uk/. Some civil registration records for Scotland may also be found at FamilySearch.org. 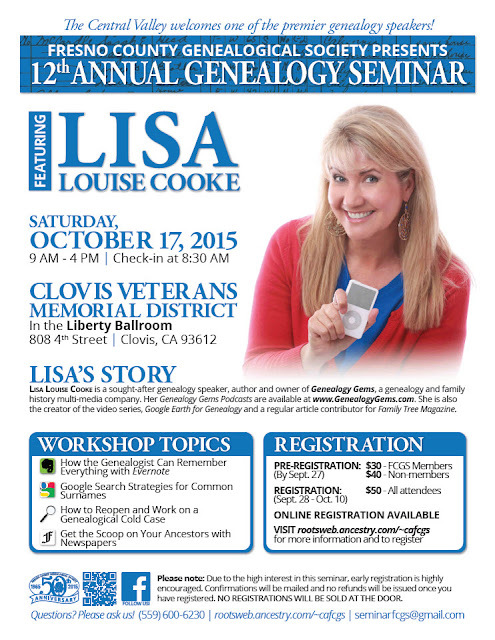 The next class I attended was "How To Reopen and Work a Genealogical Cold Case" by Lisa Louise Cooke. Lisa is a fantastic teacher! Lisa shared several tips to help genealogists solve "genealogical cold cases" in our family trees. First of all, we need to be prepared and organized. A great organizational tool Lisa mentioned is Evernote. I use Evernote and it really is wonderful. It syncs with my desktop computer, tablet and smartphone. I've used it in a variety of ways for my genealogy research. I've even created a notebook that contains the cousin connections I've made over the years through blogging, online trees, etc. Another great tip Lisa talked about is the use of timelines. She shared the story of how using a timeline helped to solve the Maria Ridulph kidnapping and murder case. This was a 54-year old cold case that was reopened and solved because of a timeline. Lisa listed several timeline websites in her presentation. These include Timeline Maker, Timeglider, Our Time Lines, and Smart Draw. She also suggested we check out our genealogy software to see if it contains a timeline feature. There were so many more wonderful tips that Lisa shared during her class. If you would like to hear Lisa present this same class, there is an opportunity to do so on October 17, 2015. She will be presenting her "How to Reopen and Work a Genealogical Cold Case" class, plus two additional classes, at the upcoming Fresno County Genealogical Society's 12th Annual Seminar on October 17th in Clovis, California. I shared the event flyer and the link for further information in a recent blog post. The final class I took at the conference was titled "Treasures in Township Records" and was taught by Peggy Clemens Lauritzen, AG. She is a fabulous teacher. Poor records, and "warnings out"
During the class, Peggy showed an excerpt from Bloom Township History. A member of the class recognized her ancestor's name in the excerpt and now she knows where he was. Isn't that awesome!? Peggy shared some helpful resources with the class including Earth Point, The Bureau of Land Management and Map of US. She also encouraged the use of the FamilySearch Wiki's articles on Rectangular Surveys, Metes and Bounds, Land and Property, etc. as well as the United States Record Selection Table. I will be sharing more about my experiences at the BYU Conference on Family History & Genealogy in a future post. I received the following email from FamilySearch this morning. SALT LAKE CITY, 15 September 2015—FamilySearch announced today that registration for RootsTech 2016 is now open. RootsTech is a highly popular and growing global conference where people of all ages celebrate family and are inspired to share their memories and connections. The annual event attracts tens of thousands of participants worldwide. RootsTech 2016 will be held February 3–6 in Salt Lake City, Utah. The website for registration is RootsTech.org. Attendees can expect a full lineup of inspirational keynote speakers, over 200 educational classes, exciting hands-on activities in the expo hall, and entertaining evening events, all designed to help celebrate families across generations! Exclusive early bird discount pricing is available now for full passes starting at just $149 and $169 for the RootsTech plus Innovator Summit pass. Passes for the Getting Started track start at $19 for a limited single day and $39 for a limited 3-day. 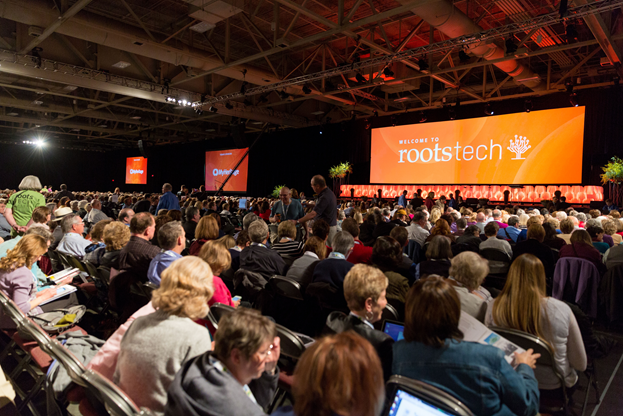 An exciting change comes to the class schedule for RootsTech 2016. Classes will now start earlier in the week, on Wednesday February 3, with the first class beginning at 1:30 p.m.
For RootsTech 2016, attendees can now use a new scheduling tool to build, edit, and print their class schedule at RootsTech.org. All RootsTech and Innovator Summit classes, including speakers, class titles, and descriptions, are now available within the scheduling tool. Attendees can begin to create and edit their schedules, and continue to edit them after registration. The online tool will sync with the mobile app available later this year. As part of RootsTech, the Innovator Summit returns to offer developers, business leaders, and entrepreneurs access to the latest content and resources that provide insight on family history data, services, and inspiration for current and future projects. Along with the Innovator Summit, the Innovator Showdown also returns to RootsTech 2016 and is even bigger than before. Innovators of all kinds in any industry are invited to compete with their latest hardware and software apps and services. The top six finalists will be invited to demo live onstage for over 23,000 people. The audience and a panel of renowned judges will decide the winners! Registration for FamilyDiscovery Day is also now open. The event takes place on Saturday, February 6, 2016, and is designed for families and members of The Church of Jesus Christ of Latter-day Saints. Members of the LDS Church are invited to register as families and groups up to 10 at a time. . This free one-day event includes devotionals, classes, interactive activities, and entertainment to help families and members discover, preserve, and share their family connections. Event details, including speakers and classes, will be made available soon at RootsTech.org. The Fresno County Genealogical Society is holding it's 12th Annual Genealogy Seminar on October 17, 2015. Attendees of this seminar will have the awesome opportunity to hear and learn from Lisa Louise Cooke. Lisa is an amazing speaker and teacher. I had the opportunity to hear her speak during a keynote address at the BYU Conference on Family History & Genealogy. I also attended one of her classes at the conference. She really makes learning fun. P.S. While you're at the Seminar, please stop by and say hi to me in the Exhibit Hall. I've been asked to host a table about genealogy blogging. Today is Patriot Day, the day we remember the terrible events that took place on September 11, 2001 when our country was attacked and nearly 3,000 people were killed. I wrote a blog post in remembrance of Patriot Day in 2012. If you'd like to read that post, click on the link below. May we never forget! Nine Months To Tell the Story by Robin Foster for Genealogy! Just Ask! 2016 RootsTech Innovator Showdown Offering $100,000 in Prizes! Have You Heard of Studio C? 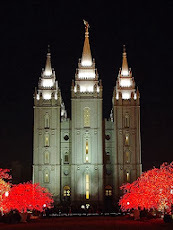 Salt Lake City, Utah, USA (September 10, 2015)—RootsTech, the world’s largest family history and technology conference, is now accepting entries for the 2016 Innovator Showdown—a “Global Innovation Competition” for developers and entrepreneurs seeking an opportunity to impact the growing family history industry while competing for $100,000 in rewards. Innovator Showdown seeks to support, foster, and inspire innovation within the family history marketplace. The deadline for submitting to the 2016 Innovator Showdown is December 1, 2015. The winners will be announced at RootsTech 2016 on Friday, February 5(Go to RootsTech.devpost.com for more information). In the premiere 2015 event, 70 talented and hopeful innovators vied for $25,000 in prizes. The success and excitement of last year’s competition has generated tremendous industry support and significantly increased the rewards. The 2016 Showdown on February 5, 2016, will offer total prizes of $100,000, making it one of the top innovator contests in the nation. Submissions will be accepted from September 1 to December 1, 2015. Sixteen finalists will be notified on December 16, 2015. The Final Round will be on February 5 during RootsTech 2016 at the Salt Palace Convention Center in Salt Lake City, Utah. David Pugmire, the Director of the RootsTech Innovator Showdown, said, “I am really pleased to see the evolution of what this challenge has become today. We find “tech” in the very name of RootsTech, and the RootsTech Innovator Showdown is the biggest realization of the union between tech and family history, bringing the technologists and their cutting edge creations in front of worldwide attendees in a meaningful and exciting way." At the finals, in front of a huge audience of family history consumers, five industry judges, including genealogy, technology and business gurus, will hear the finalists make their pitches, then field questions before making their decisions. Once again, along with Judges’ Choice cash prizes of $20,000 for 1st Place, $14,000 for 2nd Place, and $6,000 for 3rd Place, the crowd will have the opportunity to cast their votes online and on their mobile phones for an impressive $10,000 People’s Choice Award. Additionally, $50,000 of highly sought after “in-kind” prizes will be awarded. 1st Place winner, StoryWorth, is a robust story recording service based in San Francisco. 2nd Place winner, ArgusSearch, out of Germany, is an award winning handwriting recognition technology that can make transcribing handwritten records exponentially faster. 3rd Place winner, Utah based GenMarketplace, makes getting professional help affordable in an e-market where family history professionals can bid on low cost consumer job postings online. Entries for the 2016 Innovator Showdown can be made through http://rootstech.devpost.com/ and must include a video. Any platform is welcome, but projects must have a social or collaborative component. I have Norwegian and Swedish ancestry on my dad's side. So, I was thrilled to find that a Scandinavian track was being offered at the BYU Conference on Family History & Genealogy. On Thursday, July 30, I attended three classes from that track. The first one was titled "Using Online Scandinavian Church Records and was taught by Jennifer Hansen, AG. I don't have known Danish ancestry, so I haven't used the Danish National Archives website. But, I went to the website and it appears to be free to use. The Norwegian National Archives website is free, but the Swedish National Archives is a subscription based website. Swedish church records are available at Ancestry.com. To access those records, click HERE. I have personally used the Norwegian National Archives website. It's a wonderful resource! I published several blog posts earlier this year in which I shared migration records for my 2nd great-grandfather, Iver Iverson and his brother Ole, as well as Ole's Norwegian passport. If you'd like to read those blog posts, click on the links below. After Jennifer's excellent class, I attended "Tips for Solving Scandinavian (Nordic) Brick Wall Problems" taught by Ruth Ellen Maness, AG. Ruth gave us a lot of excellent information, which was awesome. Her syllabus is six pages long. I learned things I didn't know before. Ruth recommended using the FamilySearch Wiki for various topics such as Feast Days, Scandinavian given names, parish maps, etc. A case study link is included in the syllabus from the FamilySearch Wiki for Swedish genealogy called "Beyond Parish Registers: A Case Study." Here's the link ~ Beyond Parish Registers: A Case Study. Have you ever seen a family in your tree who had one or more children with the same given name? I have. Could this be the case because the first child passed away and subsequent children were given that same name? Perhaps so. But, Ruth said that we shouldn't assume this is always the case. She said that she found six children named Ole in a family and all lived and married. Another interesting tidbit from the class is that if a 3rd cousin or closer wanted to marry, they had to get permission from the king. Also, all Scandinavian countries used the patronymic naming system. Speaking of patronymics, the last class I took on Thursday was "Which Hans Jensen is Mine? Navigating Patronymics in Scandinavian Research" taught by Jennifer Hansen, AG. Which Hans Jensen is Mine? Ah yes. Patronymics...where every generation had a different surname. For those unfamiliar with patronymics, here's a basic definition. A child's surname was created by taking the first name of the father and then adding either son, sen, or sson if the child was a boy, and datter, dotter, or dottir if the child was a girl. For example, my Norwegian 2nd great-grandfather was named Iver Iverson. That just meant that he was the son of Iver. Iver Iverson's sister Mari was named Mari Iversdatter. Some information from Jennifer's class include the fact that women did not take their husband's surname when they got married. They kept their maiden name. Also, there were typical naming patterns for children. For example, the first two boys were named after the grandfathers and the first two girls were named after the grandmothers. The first son would be named after the paternal grandfather and the second son would be named after the maternal grandfather. In addition to the patronymic naming system, Scandinavian surnames could also be occupational, geographical, or even nicknames. I have so much to learn about Scandinavian genealogy research. One great resource that I highly recommend for this is the wonderful and informative FamilySearch Wiki. 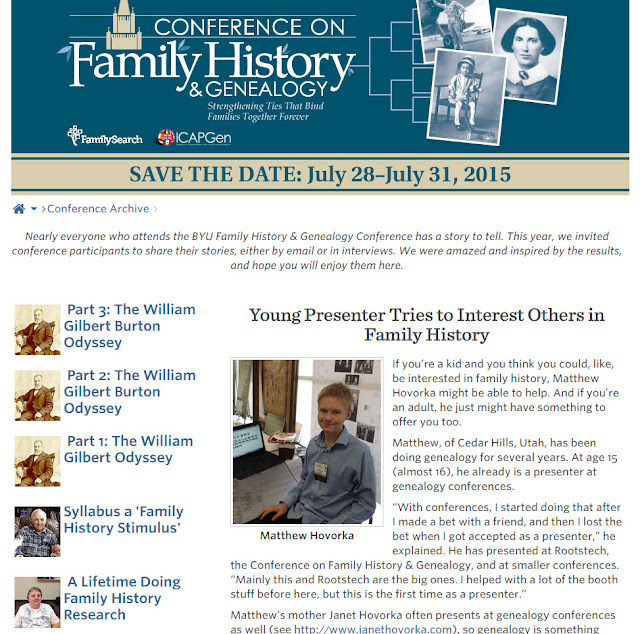 I'll be sharing more about my experiences at the BYU Conference on Family History & Genealogy in future posts.